Jared Diamond. Norton, New York, 1998 (printed as a paperback in 1999). Winner of last years Pulitzer Prize, this investigation into the biological basis of human history is both intellectually stimulating and a great deal of fun. The author, doing field work in the tropical island of New Guinea, is asked a question by a local native. “How come,” the native asks, “you Europeans have all the cargo (refrigerators, TVs, cars, etc. ), while we here have so little?” A profound question, to which Diamond gives an answer of astounding scope and clarity. Diamond has written a very good account of human evolution (THE NAKED APE), but here he narrows his focus to the 13,000 years of human history. 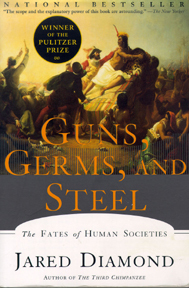 This books title, Guns, Germs, and Steel, encapsulates Diamonds answer to the question of why human societies developed differently on different continents. To reach this answer, he takes his readers on a journey through time, a masterful synthesis of biology, anthropology, epidemiology, linguistics. Few books will make you think as deeply.